These have probably been planted here, either on purpose, or by the wind. There are several sets of flowers near the summit of each thin stem. They just wont stay still in just the slightest of breezes, which is perhaps a design feature by Mother Nature. 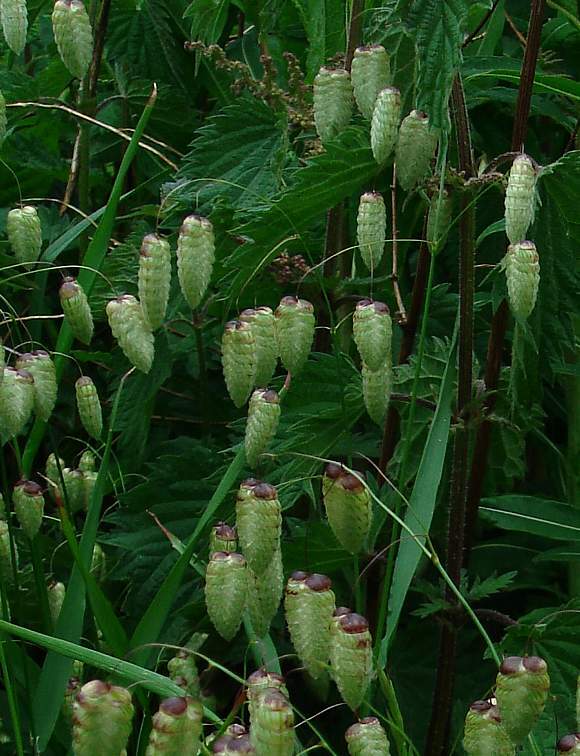 Growing wild near the coast in a wettish area. 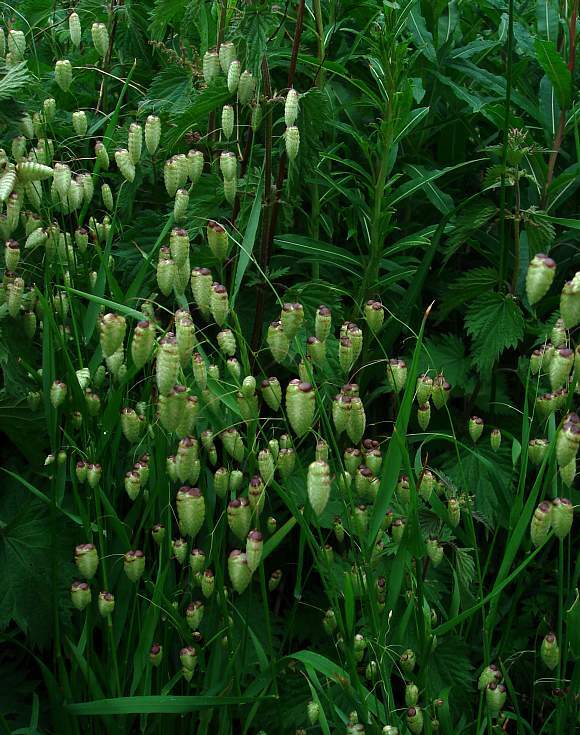 There are less than 15 pale-green florets pendant upon thin branched and yielding stalks. They look like some king of maggot. The floret is without awns, and is somewhat double-barrelled with a pointed bottom and two deep-reddish-purple 'heads' atop. Suspended by a single thin stalk from the centre of the double-top. Two sets of florets and a third failed one below them. This group of florets has some anthers which are peeking out on the right. The florets are somewhat flattened in one direction, with alternately over-lapping lemmas which are rounded on the top. 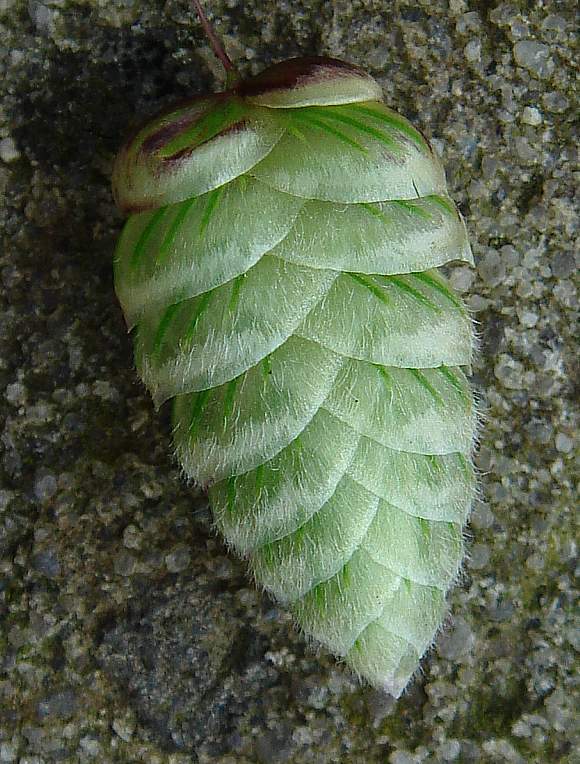 The lemmas have several thin green stripes on the back, and are covered in hairs. The topmost lemma (if that is what it is) is deep reddish-brown (brown is just dark-red anyway - try it on your computer). 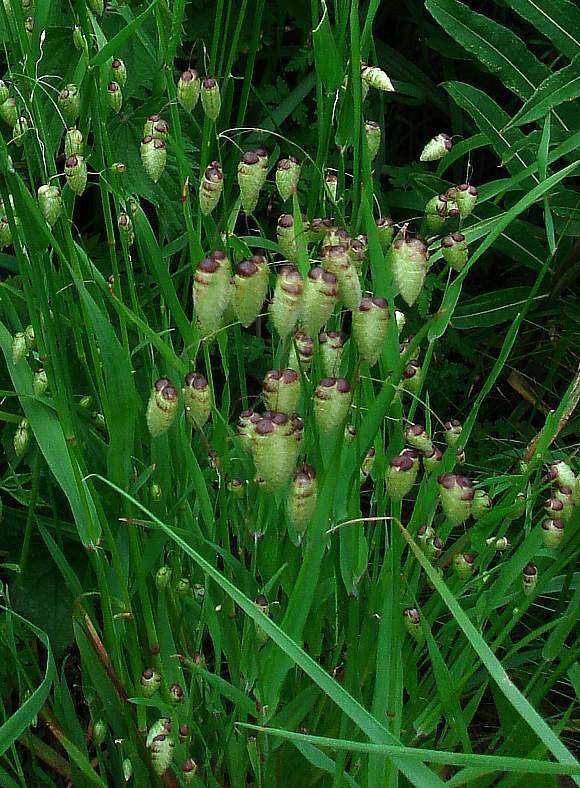 The florets, at between 8 and 25mm, are larger than those of either Quaking-Grass or Lesser Quaking-grass . The leaves are grass-like. It belongs to the Pooideae (a sub-family of the Poaceae family) amongst some major cereals like barley, oat, rye and wheat, as well as pasture-grasses and others. 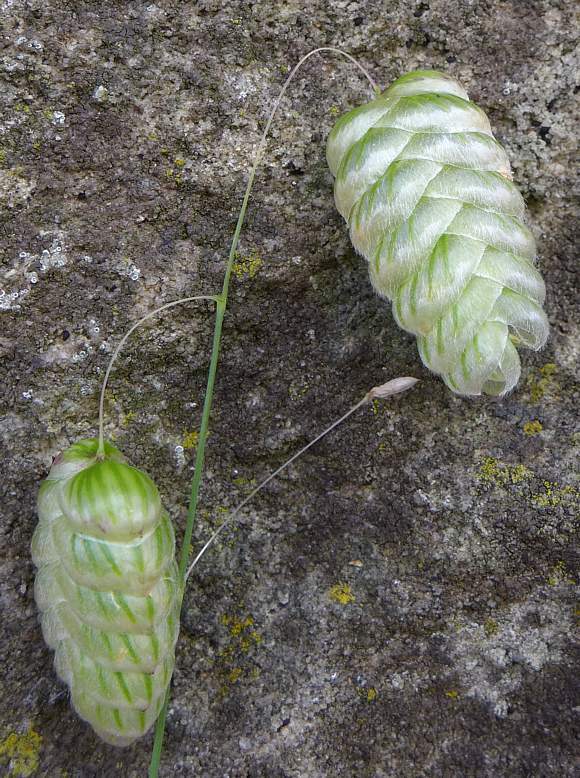 All three rattle inside when shaken because of the loose seeds within the ripe fruit. 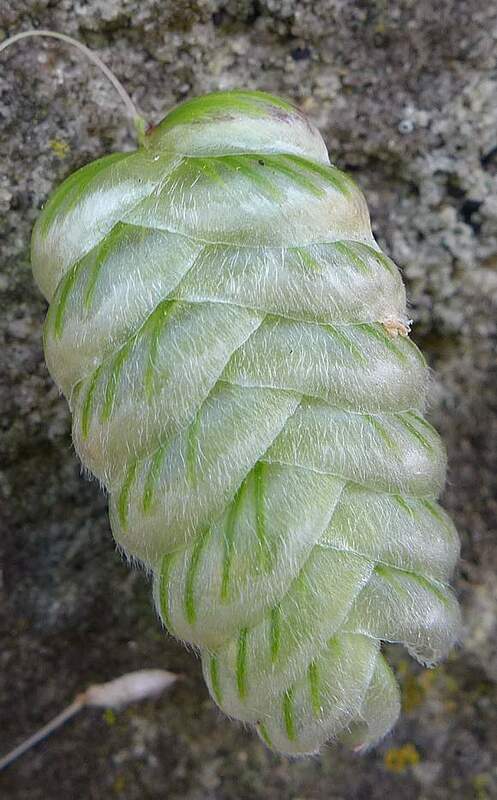 The florets are pale-green to begin with going straw-coloured later as it matures. The tops are a dark-red/purple colour. 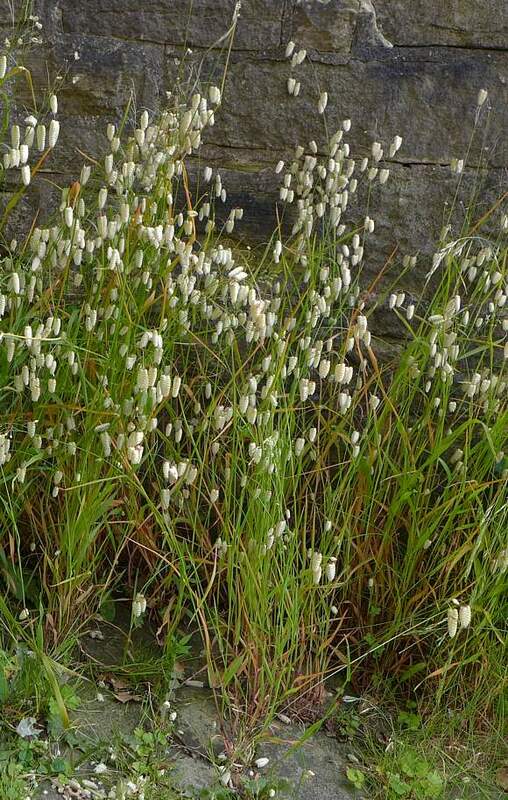 As with all quaking-grasses, the florets are heart-shaped, hanging pendant upon very thin stalks and they rattle with things shaking about loose inside. 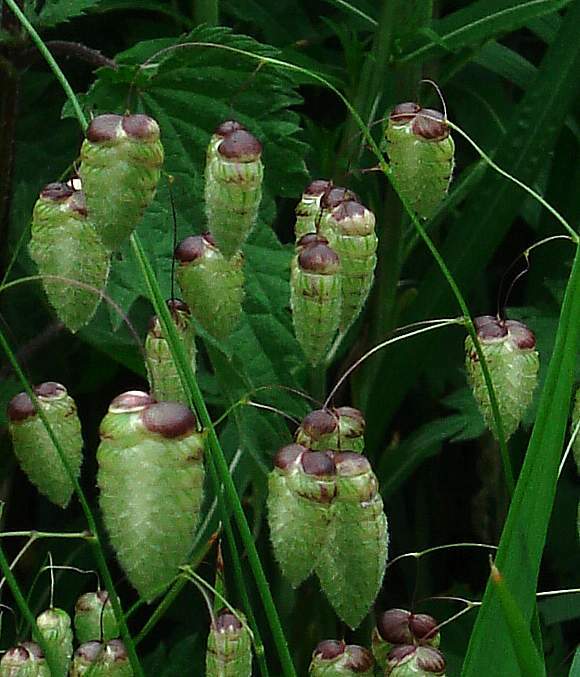 In keeping with it's maggoty appearance, one common name for Greater Quaking-Grass is Blowfly-Grass; it has many others. 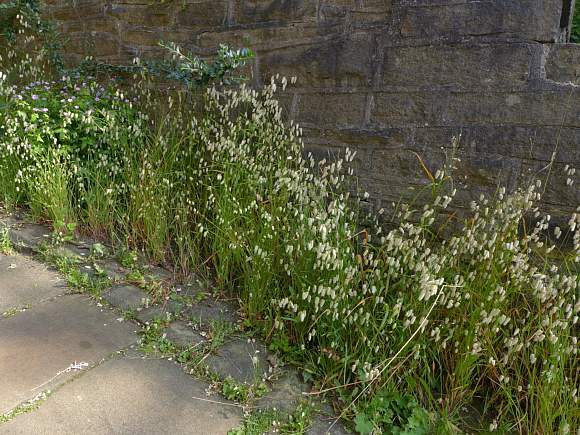 It is a non-native plant from the Mediterranean and used as a garden plant here from where it can escape, and is naturalised in the UK in several areas. 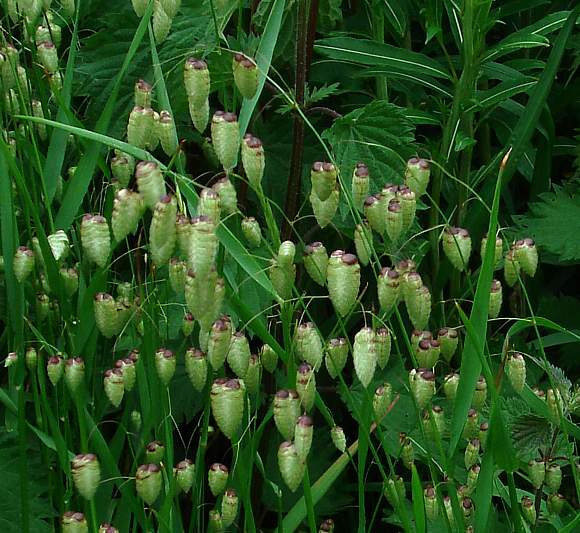 In the UK it is classified as a neophyte; only Quaking-grass is native to the UK, Lesser Quaking-grass is an Archaeophyte, having existed since the Middle Ages with uncertain status as a native.